View of a waterfall on the River Machno in Wales. 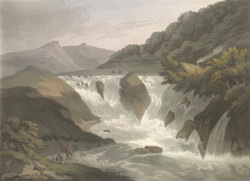 The River has its source in the Mountains at Twll y Cwm and runs to the Penmachno Woollen Mill where it meets the River Conwy at these dramatic falls. It is known locally by the name ‘Grand Canyon’. The water flow is rapid and can be dangerous but dispite this the waterfall has been a popular attraction for hundreds of years.